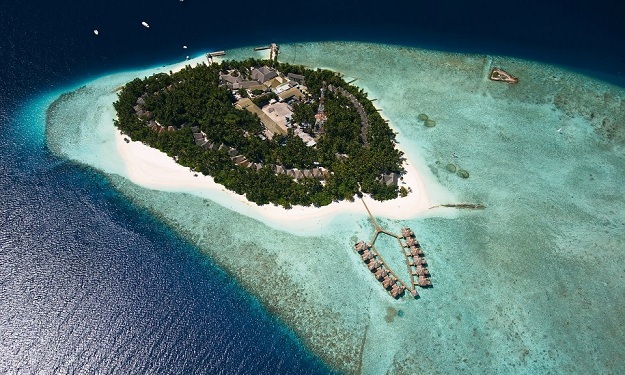 Velidhu offers you all the comforts, the little things that make a visit a holiday to cherish. When you need a break from the water or the sand, you can allow yourself to be entertained by a live band, a cultural show, or kick your heels at the disco. 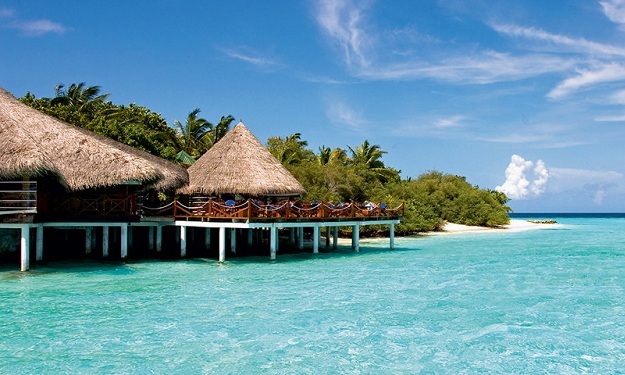 The Water Bungalows are some of the most luxurious accommodations of this holiday resort. 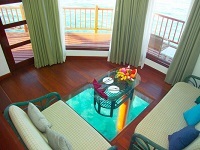 The resort has a total of 16 ‘over water’ bungalows where one can stay during their vacations in this place. These bungalows are 800 square feet big and thus have ample space inside. 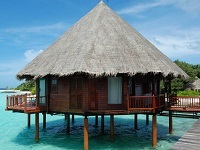 The bungalows are built on stilts and are made of wood. 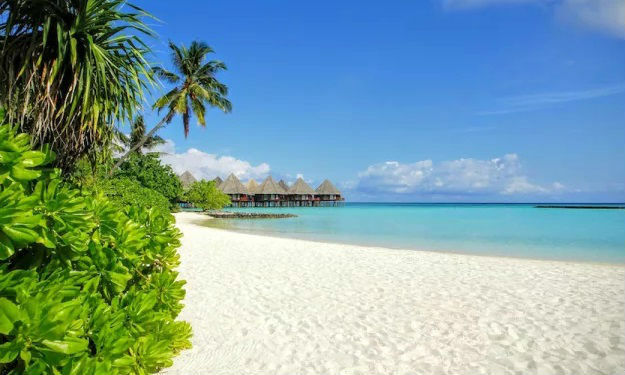 They have beautiful sloping roofs and offer a picturesque view of the sea and the surrounding area.The water bungalows in this resort are well decorated and offer a homely ambience. The rooms are well decorated and the décor is done up in neutral tones which adds to the tranquil atmosphere inside the bungalows. 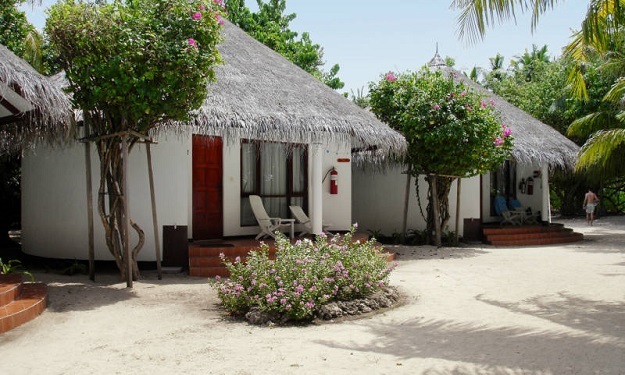 The 80 Beach Bungalows at Velidhu are designed to a single story structure and are located just beside the beach. These rooms open out to the garden area with lush palm trees and pristine footpaths leading the way to the beach. The Beach Bungalows in the resort are well decorated and is done up in neutral tones which adds to the tranquil atmosphere inside the bungalows. Each of the bungalows are equipped with all the modern amenities that are designed to suit the needs of the modern day traveler. All the bungalows are air-conditioned and have ceiling fans. The rooms has a well stocked mini bar. The rooms have huge comfortable beds, which are either queen sized or king sized. 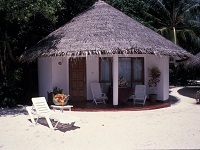 The bungalows are extremely comfortable and offer an intimate atmosphere to the guests. Each of the bungalows are equipped with all the modern amenities that are designed to suit the needs of the modern day traveler. All the bungalows are air-conditioned and have ceiling fans. 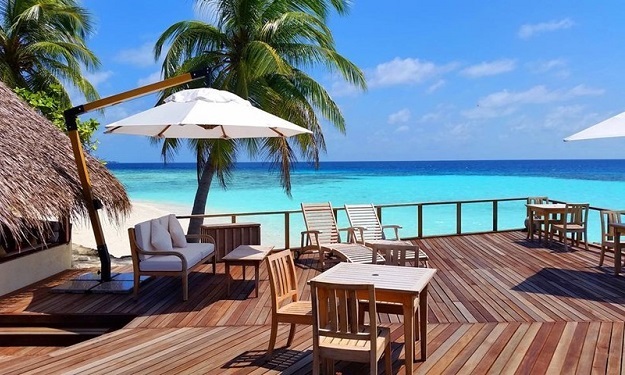 They also have international direct dial telephone connection and satellite television. The rooms has a well stocked mini bar. 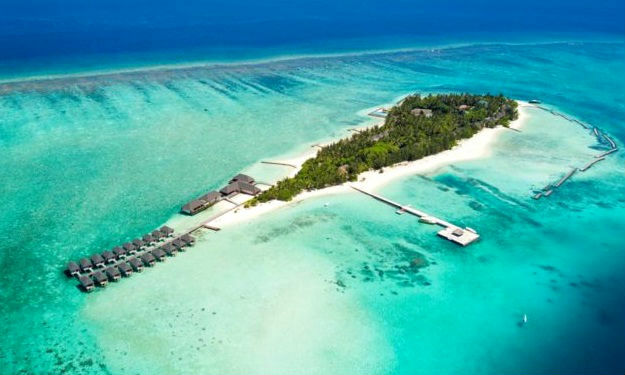 The rooms have huge comfortable beds, which are either queen sized or king sized.There are four water villas with a private Jacuzzi. It has attached bathrooms with showers. There is provision for hot and cold water in these bathrooms. One can also find hair dryers and a host of other bath amenities in these bathrooms.The water bungalows are extremely comfortable and offer an intimate atmosphere to the guests. The guests are assured of complete privacy over here. 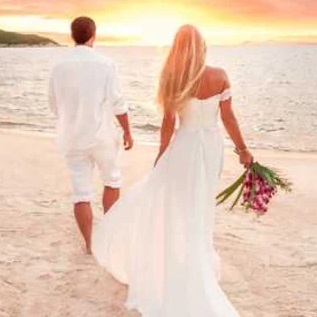 The villas are perfectly suitable for people on their honeymoon. 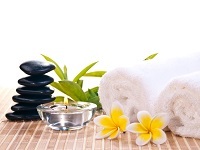 From the ultimate pampering experience for couples, to soothing treatments for sun lovers and healing remedies for sufferers of modern day stress, Huvandhu Spa & Saloon has a therapy perfect for you. Allow your senses to be lulled into a peaceful state by the welcoming smiles and soothing, skilled hands of our therapists as they employ traditional restoratives, herbs, oils, spices and flowers combined with time honoured rituals to balance body, mind and soul. 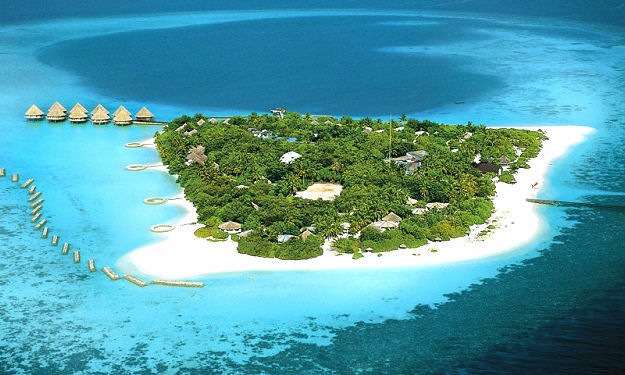 A pristine location encircled by its own coral reef for divers and snorkelers to enjoy. 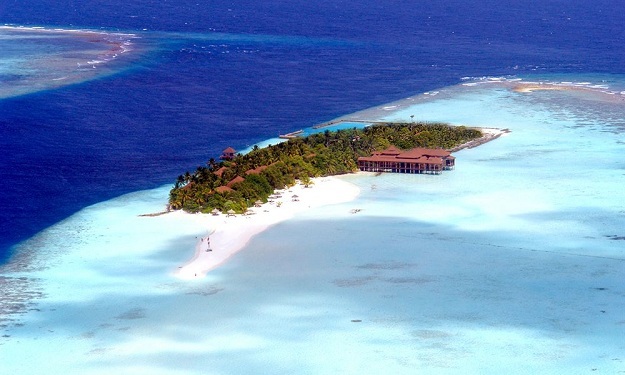 The shallow lagoon enclosed by the reef serves as a large natural swimming pool, with a colourful array of marine life.Velidhu is close to some of the best dive spots on the Maldives. Mantas, Sharks, Hammerhead Sharks, great untouched coral reefs making the diving around Velidhu to an unforgettable experience. 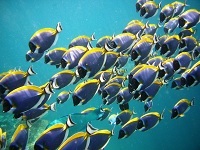 The diving team of Euro Divers will help you to have the diving holiday of your life. If you start diving here or doing your Nitrox liscence the team on Velidhu is there with a lot of experience and enthusiasm. 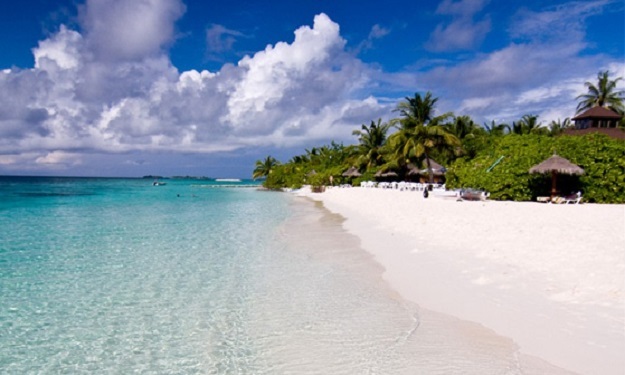 Wind Surfing: The breeze and the wind movement and the large lagoons that surround most of the islands are ideal for windsurfing. 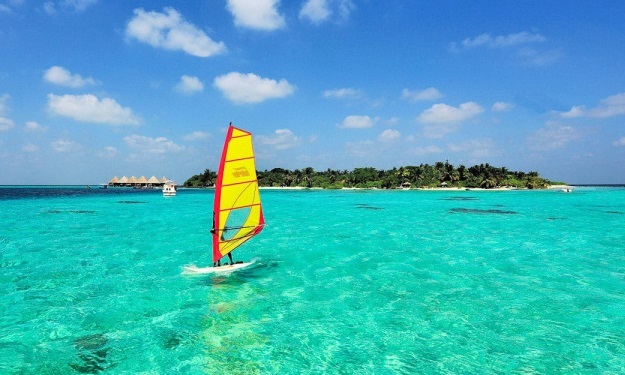 At the water sports center you could take instructions and lessons for windsurfing. Like the diving school water sports center is well-equipped. 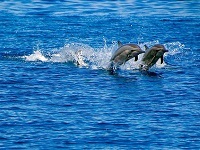 Most of the time the condition is suitable for beginners. 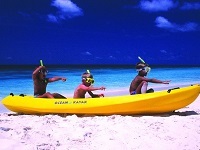 Catamaran Sailing: This is a very relaxing and refreshing sports enjoyed by the visitors. 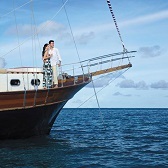 It is always possible to embark on a new adventure sailing on the beautiful blue waters of the Maldives. 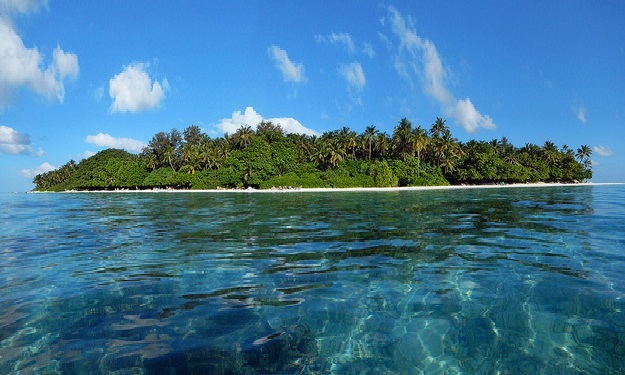 Endless stretches of deep blue Indian Ocean waters awaits you, and the lush green islands dotting the horizon in thousands would tempt you to continue sailing forever. Wide range of sports and recreational facilities with modern equipment and experienced instructors are available at the resort. These include beach volleyball, table tennis, badminton & darts. 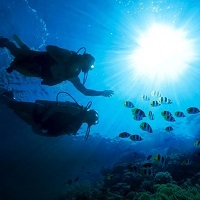 Amongst the exciting water-sports activities available are Scuba Diving, Windsurfing, Catamaran Sailing, Canoeing, Water Skiing, Wake Boarding, Ringo Riding, Banana Riding, Badminton, Beach Volley, and Excursion. Meal time is always an enjoyable occasion at the Iruara Restaurant. At the restaurant offer a wide range of delicious food’s from around the globe. Serves daily, breakfast buffets, delicious cuisines and international theme nights for dinner and serve you all your needs with the frendly waiters around you. The Beach Grill BBQ by the beach serves prime cuts of meat and succulent freshly caught sea food. 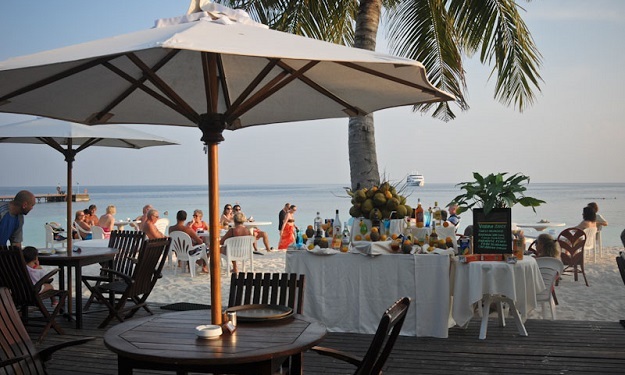 You can allow our kitchen staff to pamper you with their special meal events such as Mongolian BBQ, lobster dinner on the beach, among other specialties. The main Light House Bar is located in a prime spot and offers guests hours of relaxation with a favourite cocktail drink of the day. It is the ideal place to watch the work go by while sipping a favourite drink from a wide variety of aperitifs and beverages that are on the menu.Every night there is an entertainment and activities at the Light House Bar ranging from Bingo nights, acrobatic shot to DJ nights and many more. The Light House Bar offers a variety of liquors, wines, cocktails, fruit juices and an experience of culinary delights only on offer.The Light House Bar is open from 9.00am till late at night.